Last week saw the launch of Humanz, their first new studio album in 7 years, to widespread critical acclaim. Not only that, but tickets to their US live dates sold out in the blink of an eye this month, as did their headline show at the inaugural Demon Dayz Festival at Dreamland Margate this summer (less than 10 minutes, to be exact). Now, following on from a secret London show in March – described by Time Out London as ‘’Flat-out one of the greatest gigs we’ve seen in a whole heap of years.’’ – the World’s Most Successful Virtual Act will hit the road across Europe this autumn, culminating in a return home to play Brighton, Glasgow, Manchester, Birmingham and London in November and December (dates below). And if recent history is anything to go by, these will go just as quickly. 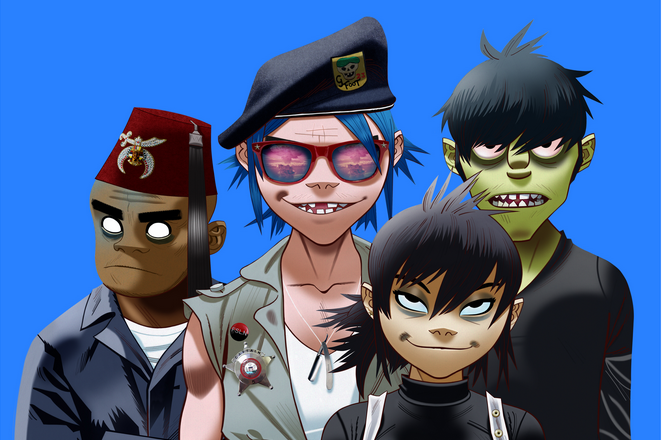 The Humanz Tour will see Murdoc Niccals (bass), Noodle (guitar), Russel Hobbs (drums) and 2D (vocals) joined on stage by the Gorillaz live band – Damon Albarn, Gabriel Wallace, Mike Smith, Jesse Hackett, Jeff Wootton, Karl Vanden Bossche, Seye Adelekan – as well as selected performers from the stellar roll call of Gorillaz’ family of featured artists. Humanz, the acclaimed new album from Gorillaz, was released on 28th April 2017 on Parlophone Records. This last month alone has seen a breath-taking amount of activity from the band – releasing 5 new tracks; scoring the most successful debut in YouTube VR history with the Jamie Hewlett-directed 360° six-minute animated film ‘Saturnz Barz (Spirit House)’; launching a mixed reality app; and enjoying another ground-breaking first when 2D and Murdoc joined Mistajam for their first ever real time interview, streamed live from London to fans around the world. And fans can access a special presale when they purchase new album Humanz through the band’s official store before 5pm today, Tuesday 2nd May.